Citizens of Wilmington, North Carolina, are seeing pink these days -- and it's not elephants! 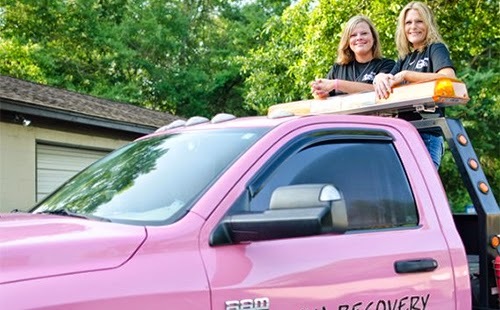 Try a pink towing truck commanded by two female entrepreneurs. The business is called Diva Recovery, but these two entrepreneurs are anything but prima donnas. They are hardworking business women who made it work in a male-dominated industry, and business is good. After 6 years, they are on the city's rotation list to get their fair share of towing jobs, and their pink truck is now very recognizable. The two determined entrepreneurs are quick to point out that women can do anything they want to do if they put their mind to it. They hope their example empowers other women to believe in themselves and go after their goals. Watch for the pink truck on television. Tonya and Renee have been contacted by a production company about creating a reality show about their company.